We opened in 2002 as the first hostel true backpacker in Perú. 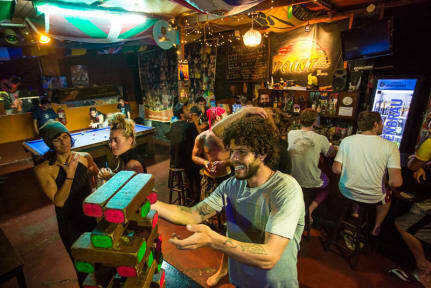 A perfect blend of a Party Hostel and laid-back place to meet other cool travelers in clean and modern facilities. 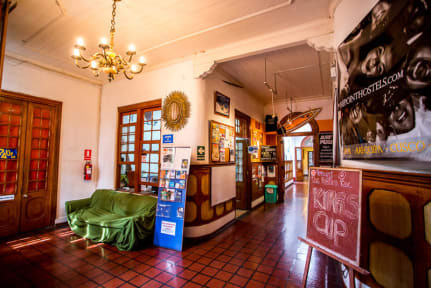 We are located in a beautiful colonial mansion, a few blocks from the main square in Barranco. This is the most vibrant district of whole of Lima, here you will be in a quiet side street and facing the ocean; Near, You can find dozens of shops, restaurants, bars, clubs and other attractions. Our comfy hostel provides you with everything that you possibly need on the road. We have an amazing staff (bilingual) who can help you to book any activities, transportation or tickets. Once you're ready to keep in track for your trip, unless you want to stay! - 24/7 hot water with good pressure. - Free WIFI and computers for your use. - Clean and comfy beds. - Free TV Lounge area with cable and DVD's. - Bar open every night till 01:00 am, plus amazing parties each week. After the bar closes, our nightlife guide will take you to a different club every night. - Restaurant from 8:00 AM to 12:00 AM. - Free Lockers with electric sockets inside. - Travel Desk (No commission). Visit us and enjoy the ultimate hostel experience! - For groups: In the shared rooms we can't warranty that the whole group will be in the same room, we do promise our best to keep your group together. - If you're a foreigner: You're exonerated to pay tax (IGV 18%) for accommodation (Decree 919, article 33 of the Peruvian Law). This will apply only if you have less than 60 consecutive days in Peru. You must show your passport and Immigration card at the check-in, in order to apply this exoneration. - If you're a local tourist: Our prices don't include IGV (tax 18%). This will be added upon the check-in. You must show your DNI to access our installations. I completely loved this hostel. Te staff was so pleasant, helpful and funny. The atmosphere of that place is the best, and I felt really comfortable there. Facilities, cleanliness, food (absolutely delicious). I’m so grateful! Thanks for the moments and memories! Super chill vibes, perfect location! The food they serve here is amazing, so cheap and yet sooo good! I loved staying at The point, really great place to meet other travelers and have a good time, its easy to socialize here. Good party hostel, excellent facilities with a great location in Baranco. Dorms can be a bit noisy, but as always this is dependant on how respectful your fellow travellers are. Bathroom was kept clean with very frequent cleaning times. Cheap airport transfer and the staff were extremely helpful during my stay. Maravilloso hostel en bohemico Barranco. Muy bien ubicado en el malecon a pocos min de la playa. Puedes comprar clase de surf y pasar tu tiempo de la mejor manera o relacionarte con otros viajeros en el bar durante clases de sushi o pisco sour. Estoy encantada! Nice atmosphere and a good bar. I found the dorms a bit cramped and it was quite noisy. The Point was disappointing. Waited at the airport for an hour at 2am before being picked up.. our room sucked and the bar was always empty. They charge you for every little thing.. bring your towels! !